Jack & Tom have been willing their two younger brothers to get plenty of naps this weekend because they wanted to play with this... 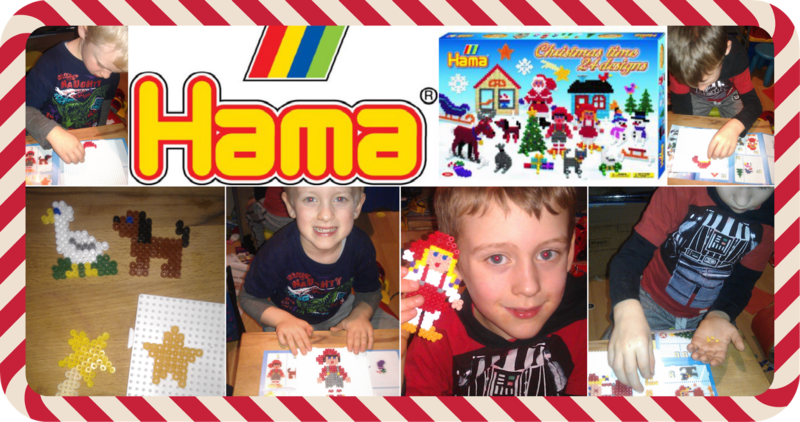 The Hama Beads Christmas set. 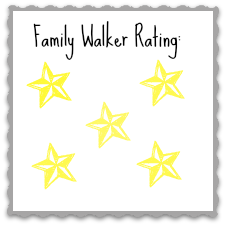 It's something that they couldn't do with a nosy, touchy-touchy toddler wandering around. But as soon as nap time came round they surrounded me "Muum! Muuuuuum! Can we use the Hama Beads pleeeeeeeaaaaase! And you know what, I just love a "kids" craft toy too so we got stuck in! This set comes with 24 designs - which as Jack pointed out meant that they could make one for every day of advent! Smart thinking! But we're a bit to impatient for that so we cracked on. Both the big lads are taking part in the schools "make your own decoration for the school tree" activity this year, and both wanted to make Santa from this set and take it in to school.... I suggested we kept Santa for OUR tree, and they both made an elf each as there are two of those in the set. SO argument averted they each chose their elf and made a start. Tom is only 4 and Hama Beads are recommended for age 5+ but he did well. He did find it a little bit fiddly to start with but we worked together on his and he soon got the hang of how to place the beads on the board. We think we might invest in some little tweezers to make it easier for him. Jack is 6 and didn't need (or want) much help at all! He followed the pattern well and soon had his design ready for setting. This is the grown ups bit! (So I do get to play too!) You get a lovely big sheet of ironing paper, and clear instructions to let an adult use the iron to melt and set the beads. It only takes moments though, quick enough for the kids to not get fed up and wander off. Hey presto! Two cracking looking elves from Santa's work shop! You even get some stands to set them in so they stand up! Although these two elves now have rings though their hats and strings so they can be hung on the schools Christmas Tree. Both boys are hoping they will win a prize! I've had a good play with them too. I've made a Snowman and a Christmas Tree. The kids are insisting that we all chip in with making Santa though. 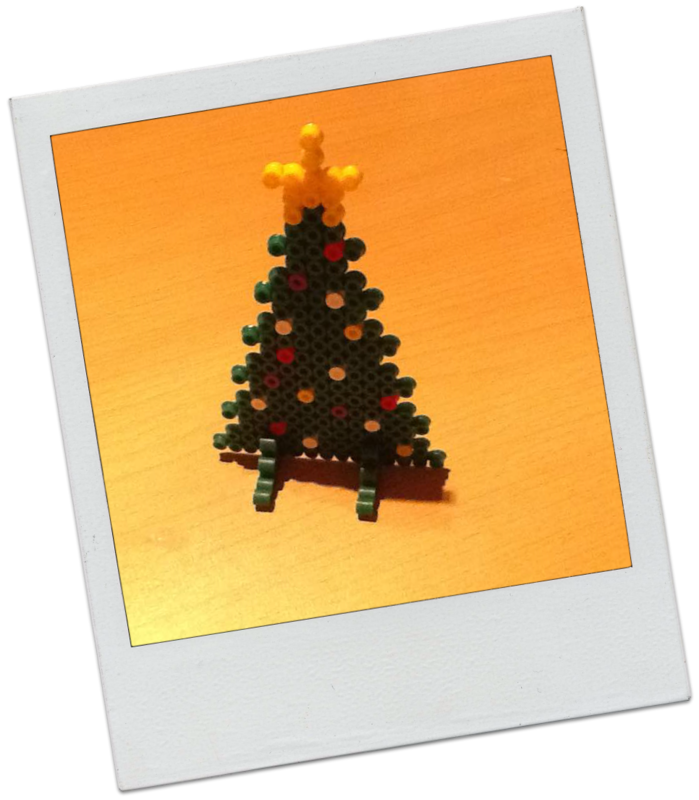 I think it's safe to say we'll have a fabulous looking tree come Christmas Eve with our new Hama Bead decorations. The kit is great! You get enough beads to make the whole set of 24 designs which come together to make a lovely Christmas scene, including presents and snowflakes. It's been a brilliant way of keeping the kids calm and focused too while they make sure they followed the pattern properly. Jack has already browsed the internet looking for other sets (he said something about Dinosaurs, and Glow-in-the-dark beads... I'll have to get another look at those I think). The boards are totally reusable, we're half way through the set and the ironing paper looks barely used so there is plenty of life left in it. You can also buy additional paper, boards, and beads and keep on creating using the same designs or try something unique! Brace your selves for a few of our creations being shared on here over the coming months. I can feel a world of school projects and Beaver's fund raising trinkets being made! Review Disclaimer: I was sent the product(s) for free. I was not paid to do this review. All opinions are my own.